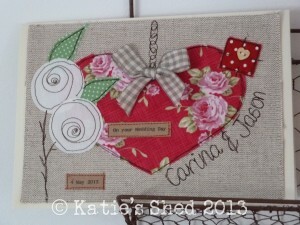 Katie Luce makes beautiful personalised cards and gifts which she sells around the world. 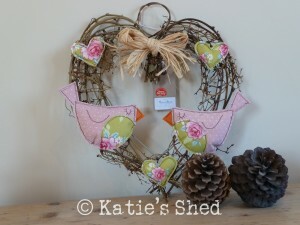 Her Faceboook Page, Katie's Shed, becomes a frenzy during her well-known "market nights" where shoppers can snap up handmade products from the comfort of their own homes. Katie has kindly given us a few minutes to tell us a bit more about her successful business. My name is Katie, I am a self-taught maker and I create unique textile cards and gifts. I use free machine embroidery to decorate a wide range of home decorations, personalised keepsakes and Christmas decorations. 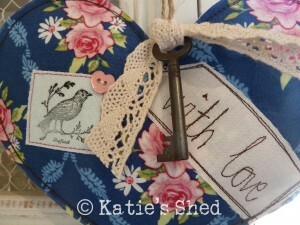 I use vintage fabrics, lace and buttons as well as lots of pretty local and UK sourced cottons, linens and ribbons. 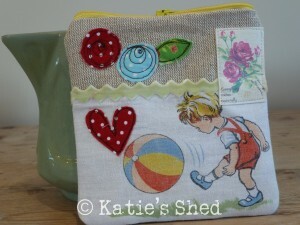 I had always worked in offices until 2009, when my passion for sewing began. I treated myself to my first sewing machine and I couldn’t tear myself away from it! 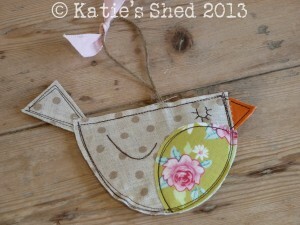 I started by making accessories for my home and handmade cards and before I knew it Katie’s Shed was born. I am inspired by what I think would look pretty in my home and gifts that I would love to receive. I am a vintage fan so am always scouring local vintage markets and brocantes. I like my creations to raise a smile and that is very much in my thinking when designing. As a lot of my work is personalised so I get inspiration from my customers when they ask me to design something for them. I sew every day in my home workroom, I like to start as early as possible, usually about 8.30 a.m. and I sew straight through until about 3 p.m. I get lots of orders for personalised cards which I love making because each one is different. After sewing has stopped for the day I spend an hour or two packing up orders, taking photos and pricing up goodies and I do admin on my facebook page in the evenings.